What has this Forum done to you ? "Learned about the " S " " ??? ..and you were doing so good on this thread. This is Boomer's wood fired smoker.. I am giving you LSC summer school. You are going to have to come out here to New Mexico and eat BBQ and run trains until you get it right. This goes in your permanent record. Sorry to be a hard case but it is BD's rules. Clearly listed in the LSC members handbook (Volume 4 chapter 12) you should have received when you signed up. It's "BBQ meat" not any of that vegetarian crapppp granted a lower grade but still "BBQ meat"
Unbelievable... some people just cannot be taught. Sean that is grilling. The weekend warrior oven broiler equivalent to New Bright trains. 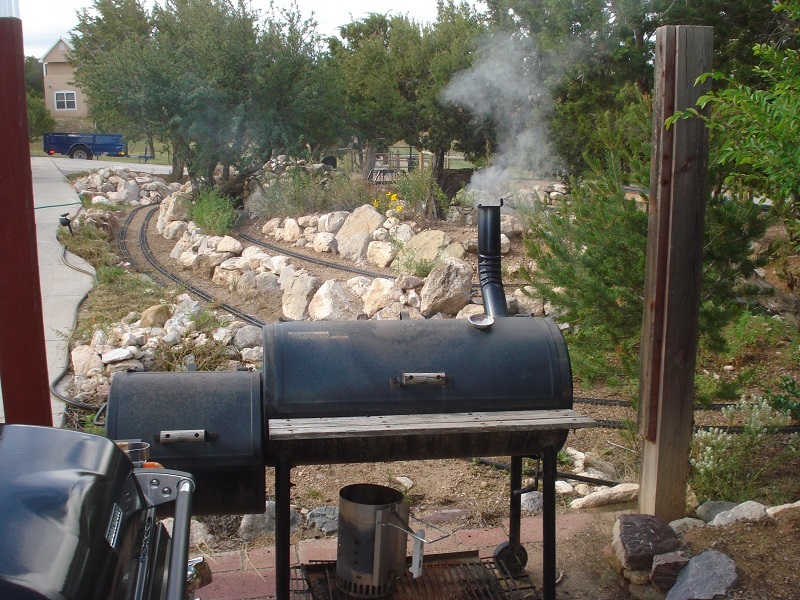 Bar-B-Que is slow smoked for hours and requires the same attention to detail as building a fine brass locomotive from scratch. What you are saying is practically heresy and since we are not allowed to discuss religion of any sort I will turn to the LSC membership for support. Dan, Pete, other Dan, Frank please chime in and help me save this poor lost soul before he starts extolling the virtues of turkey burgers or, gasp, tofu! What has this forum done to me? I'm not sure, but I'm also applying no effort whatsoever to finding a cure for it! Ok...Ok.... Boomer ..Are these pics any better ..I know what your saying .. I just posted the wrong photo .. So the term ... BBQ is equal to G scale.. There are rivet counter here as well.. enough said. Wink, Wink, Nod , Nod, you know what I mean ... You know what I mean ..
what this forum did to me - i really don't know. but this thread is hurting my feelings most deeply. smoking, barbequing and grilling all mentioned together is a sin! leaving everything else aside, grilling takes a six-packs' time, BBQuing takes a quarter of a day or a pint's time and hot-smoking (like shown) can't be done under 48 hours and a severe hang-over. the only pic in this thread, that keeps up my belief in mankind is that of the young lady who seems to know, that bears make good shish kebab. Much better Sean. Double points for that first pic which I believe is jerked beef and cold smoked bacon....the often over looked BBQ arts. And to get this thread back on track I will say how much I enjoy the people here. You tolerate my annoying since of humor and that is priceless. The craftsmanship and ingenuity is always inspiring. And of course BD has created something unique with the site. I have and will always maintain that a membership at LSC is better than a subscription to any hobby magazine. But somebody needs to say, but I won’t, I won‘t........ like hell I won’t. “BBQ and gas grills should NEVER be mentioned in the same sentence”. OK, there, I’ve said it. Ok, back to the topic at hand. “What has this forum done for me?” Well, it’s a place I can always go to to relax and enjoy one of my favorite hobbies. It’s a place I can learn not only by asking questions but simply sitting in the corner and listening (reading) and for someone who strives for knowledge, that is very important. Its a place I can offer my knowledge and skills to help others and that is very rewarding. It’s a place that has challenged me to take on projects that would probably never have been done without the encouragement and help from the many members here. But most of all, it’s place where I have made many friends, long distance friendships, mind you, but friendships none the less. Thanks, Bob, for providing a platform for all of the above to be possible. I will say this place has allowed me to continue to participate, especially after the Thanksgiving Day Massacre over on that other place. Even though that participation of late has diminished, I'm still here reading away and still messing about. well now that Dan and the Keeper of The Challenge (Dave) set Sean, Who Still should be a Bulldogstraight on BBQ, I have both a grill for hurry up need it right now and a Smoker that has not been heated up in a while, Much like Dans fabled WFPO. I have learned a ton here, have forgotten some of it and most times when I ask again I am treated like that one relative, tolerated sort of. I have learned male Chickens are incredibly talented scratch builders. There is a ton of impressive builders here, Shane, Craig, David, Boomer, Mike, BD and most of all Ray, King Ray to us mortals. Train guys love our furry helpers/ distractors/ rolling stock breakers.